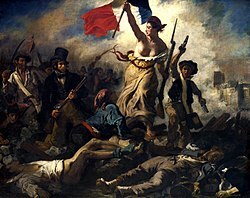 Liberty Leading the People (Eugène Delacroix, 1830) is a well known example of nationalist art. Nationalism is a way of thinking that says that some groups of humans, such as ethnic groups, should be free to rule themselves. Nationalists think that the best way to make this happen and avoid control or oppression by others is for each group to have their own nation. Some nationalists think this is the best way to save small and weak groups threatened by the mixing of ethnic groups[source?]. The opposite of nationalism is Internationalism and anti-nationalism. Many early socialists were also nationalists. The earliest forms of nationalism had lots of socialist features. In this period, political thinkers who thought that ethnic groups should not be oppressed by other ethnic groups thought also that 'normal folk', the backbone of society, like workers and peasants, should not be oppressed by higher social classes like rich people. They thought that it is wrong for somebody to live in great welfare that is made of the hard work of others, or the oppression of others. All the social classes should work together and have a common goal that aims for the good of everyone. These goals can be called "national interest". National interest is ideal and not always easy to find. There are different ways to reach national interest, for example politics. Nationalists started to support and admire normal people[source? ], especially peasants, who were seen as uncorrupted, gallant, and fair, unlike high classes. For example, normal folk often had more original and local ethnic culture than high classes, whose culture was seen more rootless. National Romanticism was based much on the ideal of uncorrupt folk. Socialism and nationalism grew together, but they have also been placed in opposition in some theories. The most known opposition between these ideologies was with the Soviet Union. The Soviet propaganda made nationalism an insult word that was linked with opposed ideologies like capitalism, liberalism, imperialism or fascism. Still, even in the Soviet Union and other communist or socialist countries, there was nationalism in great measure (even if it was not called with that name)[source?]. The most capitalist countries like United States were patriotic rather than nationalist. The Nordic countries, which were among the most pure nation-states (countries that follow nationalist principle), were not very capitalist or rightist; they were built on the social democratic idea, which is left. Only after Nordic countries became more multicultural did their politics become more rightist. Today nationalism does not have a common stand on those fields of politics that are outside of its basic goals, like left-right politics. However nationalism can be a part of bigger political ideology or agenda that can be leftist or rightist or something outside that classification. Nationalism is still usually connected to goals that resist strong hierarchy between social classes inside society. Nationalist people are usually more or less against the strongest forms of capitalism, which they think gives too much power to rich people and big companies. Nationalism had an important role in ending the colonial rule. Nationalism spread to colonies and made their people desire independence. Nationalism also made the people in metropolitan states (countries that colonized others) accept more the desire of other people to rule themselves. However nationalists think that the end of colonialization of Africa was not done well. They think that there would not be so many conflicts in Africa if African nations had built in a nationalist way (so that every ethnic group is its own nation). After the imperialists left their African colonies, the new nations were built with borders that were not the same as the ethnic borders. New nations became nations with many ethnic groups, which do not want to or cannot live peacefully in the same society with the others. ↑ "nationalism Definition in the Cambridge English Dictionary". dictionary.cambridge.org. Retrieved 2017-02-08.